bl.uk > Online Gallery Home	> Online exhibitions	> Asia, Pacific and Africa Collections	> Christ's Church, Gauhati. Assam. 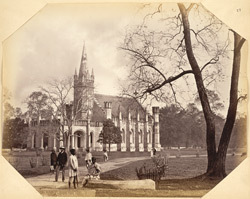 General view of the church and grounds, with figures posed in the foreground and on the path, photographed by Oscar Jean Baptiste Mallitte in the 1860s. The church has crenellated engaged bastions, arched windows and pointed finials typical of neo-Gothic architecture in Europe. This direct transposition of European stylistic features to buildings in the sub-continent is a theme seen in many examples of colonial British architecture in India. Guwahati, once known as Pragjyotishpura (the Eastern City of Light), is capital of the state of Assam and is at the centre of the most important tea growing area of India. The town is situated on the edge of the Shillong Plateau at the point where it reaches the River Brahmaputra and is the gateway to the whole north eastern part of India.